Collision repairers in cities employing red-light cameras might not receive less business than their colleagues, according to a 2017 analysis highlighted this month by Case Western Reserve University. A professor and alumni of Case Western Reserve (the latter now a grad student at the University of Arizona) in SSRN used 12 years of Texas Department of Transportation data to examine crashes in Houston before and after red-light cameras were removed by voter referendum. They used data from Dallas, which still has the cameras, as a control group. According to Case Western Reserve, the number of “angle” crashes like T-bones increased 26 percent after the cameras were removed. The Case Western Reserve-Arizona study did concluded that the existence of cameras bumped up “non-angle” collisions by 18 percent in Houston before the city axed them, according to Case Western Reserve. Such crashes rose 28 percent when both Houston and Dallas data was used, the university wrote. This was attributable to drivers braking “harder and more abruptly, increasing fender-benders and other so-called ‘non-angle’ collisions,” according to Case Western Reserve. “Once drivers knew about the cameras, they appeared to accept a higher accident risk from slamming on their brakes at yellow lights to avoid an expensive traffic citation—thereby decreasing safety for themselves and other drivers,” Case Western Reserve assistant professor Justin Gallagher said in a statement. ficant change in the number of injury accidents after the camera program ends,” Gallagher and co-author Paul Fisher wrote in the study. Gallagher and Fisher found that the odds of dying in a crash were the same whether it occurred at an angle or not. However, angle crashes are more dangerous — more likely to produce an incapacitating injury. It’d be interesting to see if the angle crashes shown to be more dangerous to people are more likely to produce higher severities. 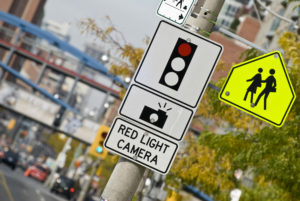 If so, Gallagher and Fisher’s conclusions suggest the existence of red light cameras could be even more beneficial to auto body shops by both decreasing totals and increasing the number of repairable collisions. Other research shows a different result. Northwestern University last year determined using data from 2005-07 and 2010-12, before and after two years of extensive camera rollout in Chicago, that the combined number of angle and turn crashes fell 19 percent. Rear-end crashes rose 14 percent. Overall, crashes fell 10 percent. That study did not include noninjury crashes. “However, some intersections appear to experience no significant safety impact,” the study also noted. In 2016, the IIHS concluded that removing such cameras increases the rate of fatal red-light running incidents 30 percent.